The Joseph Mason company was founded in Derby in the United Kingdom in 1800 and soon developed a strong reputation for high quality finishes for coach builders. In 2000 Akzo Nobel Car Refinishes acquired the transport activities of Mason Coatings and with it the Mason CT commercial vehicle brand. Today, in the United Kingdom, Mason CT is a leading coatings brand in the commercial vehicle market with a strong tradition in product quality, expertise and reliability. Its high standards won special recognition in 1982 when it won the Royal seal of approval with the award of a UK Royal Warrant. Mason CT is constantly developing new products with bodyshop profitability in mind. The focus is on ease of application and drying time to speed up the paint process. 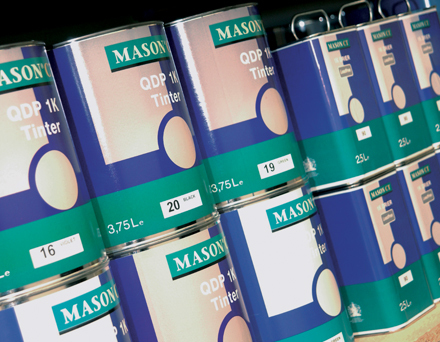 With Mason CT, customers can count on a full range of reliable products including primers/fillers, topcoats and ancillaries with excellent performance. The range has been expanded to include a full selection of 2K products including 2K primers, plastic primers and a dedicated CV clearcoat.